From the Baldwin County Courthouse, go west on Hancock Street for 2 blocks or 0.2 mile (or the one large block containing Georgia College & State Univ.). Turn right on Clarke Street. Go one large block or 0.2 mile. Turn left onto Business 441 North (Montgomery St.) and follow the signs for Business 441 N (turn right on North Columbia St.). Go about 7-1/2 miles. Turn left on Meriwether Rd. About 1.2 miles from 441, turn right on Stewart Drive (paved). Travel for 0.6 mile and pass a cemetery on the left, and, at forks, take Pine Cone Rd. (on the right). Travel for 0.7 mile to Pennington Rd. NW (on the right). Travel 0.5 mile and turn left on Penny Lane NW. Cemetery is 1/2 block (1/8 mile) from this turn, on right side of Penny Lane, about 20 feet from the road. 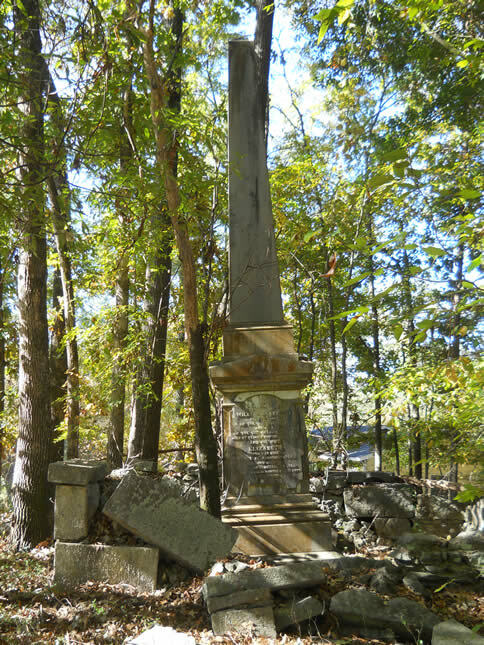 This cemetery is in the woods on an unbuilt lot, but the tall granite shaft is visible through the trees. A granite wall surrounds the graves.